Your complete guide to the Payroll end of year process and reconciliations. - Reconcile the payroll system to the General Ledger and BAS's for the year. 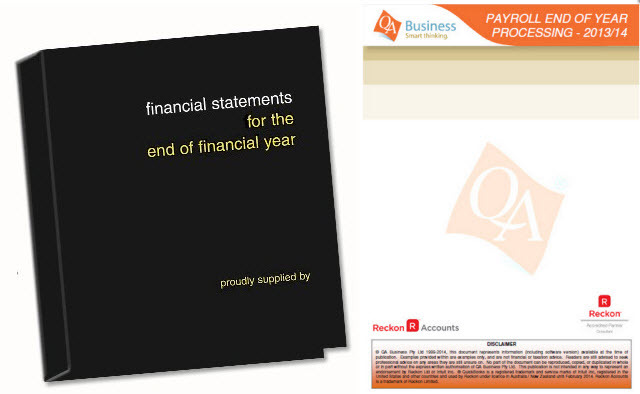 - Produce the End of Year Payments Summaries for your employees. - Produce the EMPDUPE file for the ATO. - Reconciling your Superannuation Payable Account. - Reporting on Leave Entitlements owing at 30 June. The Official Reckon Accounts End of Financial Year (EoFY) Guide for 2016/17 plus Storage Binder and checklists. The purpose of this product is to SAVE your Accountants time and your MONEY. The guide and checklists have been designed by Reckon Accounts experts and Accountants to show you how to fully review (Quality Control) your Reckon Accounts Company file prior to sending it to your Accountant. Discover the reports that your Accountant needs to see in order to prepare your financial reports and tax return for the year. (#) - Once your order is processed within 24-48 hrs you will receive an email containing a link to access the manual and checklists online.